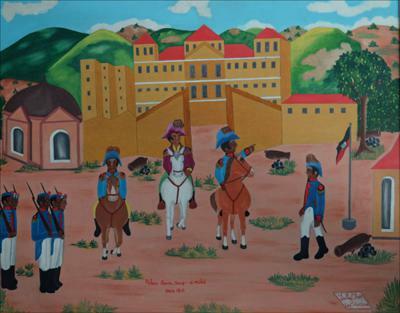 This is an historical painting by well lknown Haitian artist, Sully Obin. This is a military scene of the early 19th century, 1815. I depicts he officers are Toussaint L'Overture and Jacques Dessalines who led the slave revolt which freed Haiti from French colonial rule. This painting is in excellent condition and is titled at the bottom "Palais Sans-Souce a' milot vers 1815". It was purchased in the late 60's.